For all my talk of finishing ‘The Change Handbook’ (which i have been promising for a year…), i have failed to make much progress. Possibly i scared myself off: the manuscript is 82,000 words, and i want it to be no more than 65,000. Possibly less. But that felt like a huge chunk to edit out. Inaction is not a strategy though, so i’ve decided to nibble it in small chunks: each time i find a spare half hour, i’m trying to carve out 250 words. 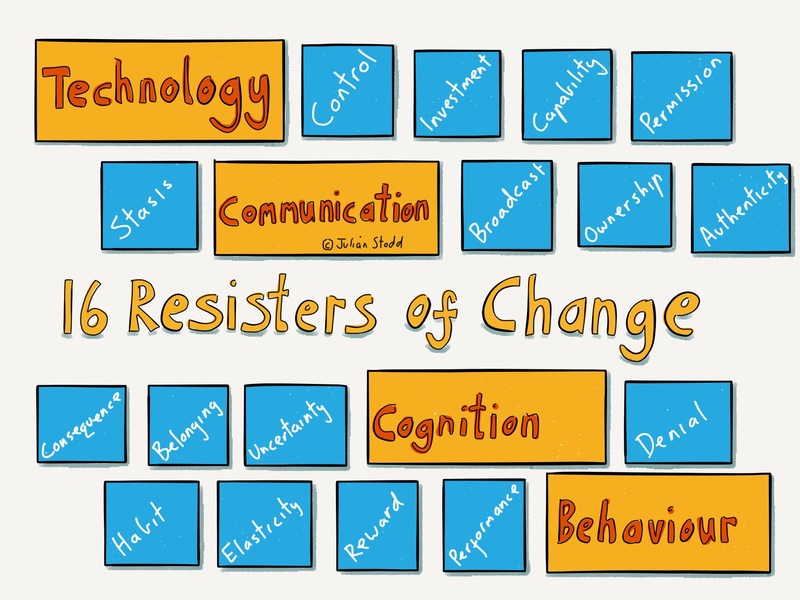 Today, as part of #WorkingOutLoud, i’m sharing the revised chapter on ‘Control’ as one of the Sixteen ‘Resisters of Change’. This version has 492 words edited out of it! Organisations accumulate infrastructure: buildings, furniture, vehicles, tools, and technology. The trappings of power and success. These formally held assets are not simply physical, but come with associated rules and conditions: we are mandated to treat them in certain ways. There is often an underlying assumption that we are privileged to have access to them, and the ways that we treat and utilise them are governed and controlled. But in the Social Age, technology has become democratised: in the old world infrastructure was complex and expensive, it made our lives easier to be in an office where we had access to printers, file storage, the Internet, and computers, but today, that infrastructure is everywhere. In our own homes and coffee shops, we have access to connectivity and creativity that was hitherto unheard of. And yet while the ecosystem of technology has changed, organisational attitudes towards it, and specifically towards the control of it, have not changed as fast. Where organisations have permitted people to use their own technology, it is often still positioned as a favour, or as a cost saving measure for the organisation, rather than a true belief that individuals are getting better at organising their ecosystem of productive technology than organisations are able to. In my own ‘Landscape of Trust’ research, the initial results suggest that we trust formal technology less than technology which we own themselves (just search for ‘Trust’ on the blog, to access my primary research on this subject). This trust appears to relate to ownership and control, and the ability to apply consequence: technology that we own ourselves, we have greater control over, and that may lead to higher trust. The core question is what role technology serves within the organisation and how it is experienced on a day-to-day basis. Is technology experienced as a facilitating feature of organisational life, or experienced as a mechanism of control? Does the organisation subscribe to a model of heavyweight infrastructure, or lightweight, adaptive, and fluid technologies that can be swapped out at speed? In Resistant organisations, IT is largely experienced as a mechanism of control: they are the people who give you your laptop when you start the job, and who tell you what you can, or cannot, use it for. When you leave the job, they are the people who take the laptop away from you. In Resistant organisations, technology is ‘locked down’, that very expression being one that is used in prisons when we wish to restrict people’s movement. To go on lockdown is to hold everything in a perfect state of stasis. In the old world, technology was expensive and complex, building and maintaining systems was difficult, so procurement decisions tended to be both significant, and semipermanent. That may still be true today for large organisations, but in social spaces, in our personal lives, something very different occurs. We are used to highly diverse ecosystems of apps where the barrier to entry for us to try out a new piece of technology, or new software, is very low, and the consequence of abandoning it almost non-existent. In this new space, we experiment more and more, and experimenting is a core feature of agility. Indeed, we experiment collectively: we crowdsource wisdom, rather than believing that we hold it all ourselves. A desire for safety often veers into social engineering, censorship, or a mean-spirited desire to stop people doing the things they want to do. In a world that demands agility, restriction is rarely the answer. A mindset of control, based upon the false premise that the organisation still owns people, and has a right to control every action that they take, is outdated. In an age of portfolio careers, the gig economy, and a fractured Social Contract, we can attempt to exert control, we may even be able to enforce some control, but it is at the cost of engagement and contributes directly to the erosion of trust. The shift in a Socially Dynamic Organisation is likely to be from ‘control’ to ‘facilitation’: instead of seeking to own the spaces and technologies through which people are creative or collaborate, these organisations will seek to enable. Certainly they will provide formal technologies, spaces which are safe and controlled, spaces for sensitive conversations, spaces with privileged access to information, but most likely they will also have spaces for more socially democratised and collaborative engagement. Trying to own and control all the spaces most frequently leads people to simply subversively engage out of sight. The formal organisation cannot control or remove the social desire for private and collaborative space, better to recognise this and be engaged in facilitating it than simply deny it. But to engage means to recognise the reality that we simply can’t deny or control it. The Socially Dynamic Organisation will worry less about its ability to control which platforms people collaborate on, and more on developing Social Leadership capability in collaboration itself. There are risks around technology, but often IT and HR move beyond simply managing risk. They act to justify their own existence and reinforce their hierarchical power. This type of power based control is directly counter to a mature, fair, and respectful, Socially Dynamic Organisation. This is not an incidental issue: we need a holistic pattern of adaptation. We need an IT entity which is facilitating and enabling, along with an HR entity, senior leadership, recruitment, and so forth. If we only adapt part of the organisation, other aspects will work against the change. We will remain Resistant, or at best Constrained. As long teams find their strength in controlling, they will sit in opposition to the community, and hence we will fail. The controlling nature of technology, and hence the temptation to control, is often founded upon technical features. For example, many organisational social collaborative technologies include the technical ability for asynchronous moderation of comments and posts, and hence organisations end up moderating comments and posts. But moderation is experienced as the formal application of ownership and power, and a lack of trust in the community. Moderation does not silence dissenting conversation, but rather moves it into democratised spaces that are out of our earshot, so we lose twice: we lose the ability to contribute alternative views, and we lose the ability to hear the wisdom of the community. To overcome this aspect of Resistance requires a change in mindset and behaviour. It requires a new attitude towards technology, and indeed a new attitude towards risk. Relinquishing control actually gives us greater access to the community that may help us to avoid future risk. In a connected world, our ability to control messaging, to own stories, is significantly degraded, and this is a good thing. We need to find ways of being safe that don’t rely on formal control, and technology is often experienced as the most easily applied and most formally mandated mechanism of control. True safety, and compliance, is a cultural feature, not a technical one. We must find new ways of being safe, based on deeply engaged communities, high levels of trust between senior leadership, managers and leaders, and an engaged community. This will not be applied off-the-shelf using a feature of technology. 1. Move beyond control, beyond the notion that the organisation knows best. 2. Maintain safe spaces which are well understood, safe technologies which the organisation owns, but also find ways to integrate more social technology, moderated by the community. This entry was posted in Change and tagged Change, Control, The Change Handbook, Writing. Bookmark the permalink.